Donate any amount any time. Donate any amount, any time. You may set the amount for your donation. Please give generously. Any level of support is welcomed and appreciated. Your continued support will keep our bridge swinging well into the future. You, your company, your relatives, your friends and even your pet will have a permanent place in history while supporting the Androscoggin Pedestrian Swinging Bridge. 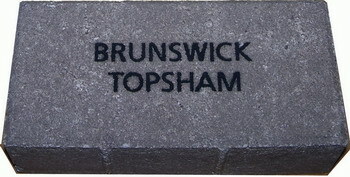 Your engraved brick will be installed at the foot of the Bridge tower on either the Topsham or the Brunswick side of the river. Linda Baker, State Senator for Sagadahoc County and Dresden, with Chief Baker's memorial engraved brick at the Swinging Bridge. sign of your community support! Bricks will be installed once a year.